My birthday is on Saturday!!! I'm so excited to celebrate my 21st birthday while simultaneously sad to be taking another step toward adulthood. Last year I shared 5 things I learned since turning 20 a few months after my 20 birthday because so much happened in a short span of time. 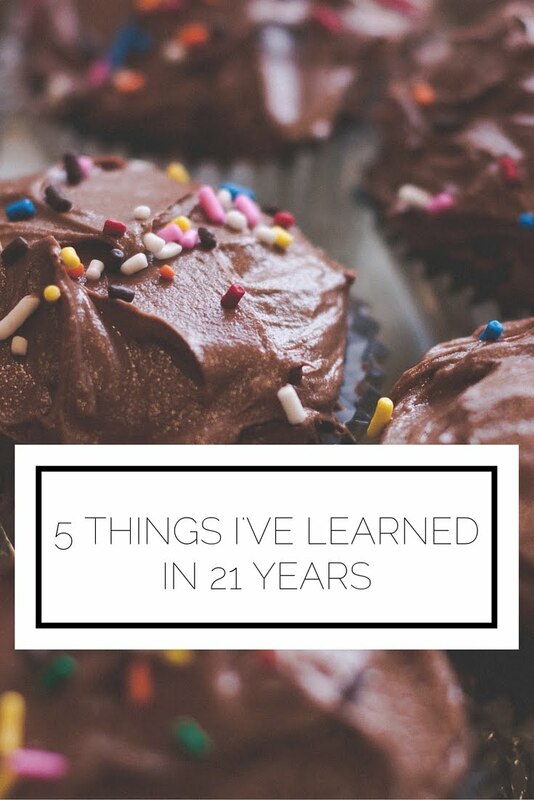 Today I'm going to let you in on the 5 things I've learned throughout my years on this earth. Enjoy! 1. Life is one constant project. It's just a series of trials, one right after the other, until the end of your time. Seriously. As much as we strive to have it all figured out and get ourselves to that perfect sweet spot of contentment, there is always something that will come up. If you're not identifying new areas to improve or facing new challenges, than you're not actually growing. So embrace it! 2. Hard work is the only way to get what you want. In the same vein as number 1, this constant project we call life requires hard work. You must be disciplined and put in the time and effort if you want to see results. This applies to everything from your grades, to your health, to your relationships. Nothing comes easy so you must figure out what you want and be happy to work for it. 3. It's all about the memories you create. Some of All of my best memories have some element of something going wrong/something daring/something happening on a large scale. People will say that it's the small moments that create the greatest memories, and to some extent that's true, but for me I like big, unique things (see skydiving, a Shahrukh Khan concert, sales competitions, and beautiful events). Trying different things and discovering what you think is wicked awesome will allow you to create more of the memories you cherish. 4. Find some interest you love and soak it up. I don't mean you have to choose something like fine art (although if you do, that's awesome!) I'm referring to discovering a genre of music, or type of book, or style of cooking. Immersing yourself in an interest is fulfilling, rewarding, and makes you a more dynamic person to talk to. The most attractive people are full of passion not only for their family or work or friends, but also for what gives their hearts joy. For me, it's all about Bollywood. And American revolutionary history. And minimalism. And etiquette. So you see you can discover a lot. 5. You can choose to be happy. Although it may seem like circumstances and the actions of other people dictate your happiness, it's not true. You, my darling reader, are in complete control how you respond to anything you face, and you can choose happiness. Yes, it is tough. Yes, at times it may seem impossible. But the fact of the matter is that your brain and emotions are at the mercy of your will and perspective, so make it good! Well, that's some of what I've learned in the past years (along with a lot of song lyrics and useless facts for classes I never want to think about again). What are some of the life lessons you carry with you?